WRA 2018 Autumn Meetings, namely WRA Board Meeting, WRA General Assembly and WRA Innovation Conference, jointly hosted by WRA and ACRI, came to a successful end in Prime Hotel, Beijing China on Nov. 16, followed by two plant visits in Zhengzhou on Nov. 17, which is regarded as a milestone in WRA's young history since its establishment in 2015, for it is the first time for WRA to hold an international conference with non-member participants. Refwin was invited to make a full coverage report and have an exclusive interview with Mr Stefan Borgas, President of WRA and CEO of RHI Magnesita. On the afternoon of Nov. 15, WRA Board Meeting and WRA General Assembly were convened as schedule from 13:00 to 18:00, starting by lunch (provided by ACRI) and ending by dinner (sponsored by Vesuvius), with participants from ALAFAR, PRE, TRI, and ACRI, IRMA, JRA, as well as representatives from RHI Magnesita, Vesuvius, Refratechnik, HWI, Magnezit, POSREC, Intocast, Beijing Lirr, PRCO, and Sinosteel Lirr. Conference Agenda covered welcome address made by WRA President Stefan Borgas, presentation of anti-trust/competition rules/safety briefing made by Ms. Simona Vackeová, WRA Secretary-General, approval of the minutes of the last meeting, and administrative matters including overview of Board members for 2018, update on new membership & feedback regarding potential members, WRA accounts adopted in 2016 & 2017, adoption of WRA budget 2019, WRA annual contributions, report by the Secretary General on WRA Activities since the last meeting, and planned WRA meetings in 2019. The next WRA General Assembly will be organised in the context of the UNITECR 2019 in Yokohama in Japan, date is to be confirmed in the week 13-16 October 2019. On the morning of Nov. 16, WRA Innovation Conference was held, focusing on "Future Trends in Refractories", with over 100 participants including non-members from Austria, Belgium, UK, Germany, Spain, Russia, Brazil, India, Japan, South Korea, USA and China. 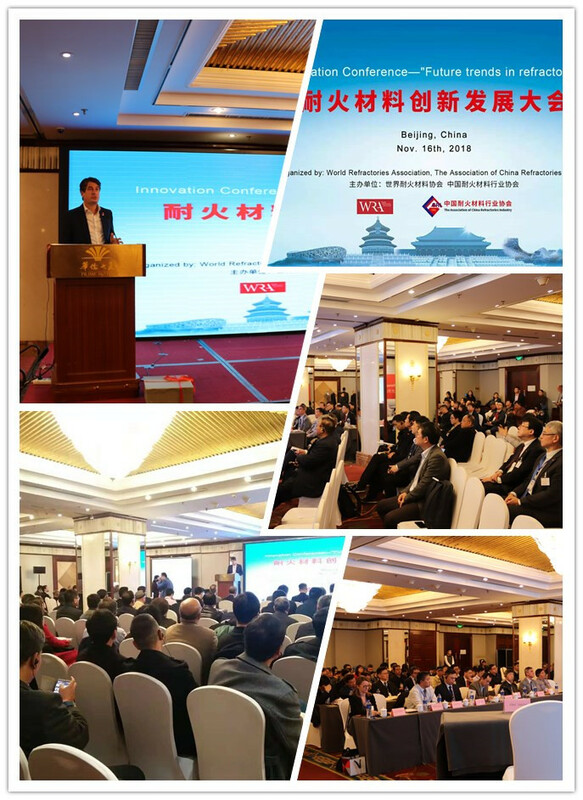 Mr. Stefan Borgas, WRA President and Mr. LIU Wei, Chairman of ACRI seperately made a welcome address, followed by a Keynote speech conducted by Mr. YUE Quanhua, Deputy Director of Building Materials Division, Raw Materials Department of Ministry of Industry and Information Technology of the PRC. Among the invited presentations, "The energy saving approach on the refractory industry" was made by Mr. Luis Rodolfo Mariani Bittencourt, CTO of RHI Magnesita; "China refractory industry in structural optimization" made by Prof. ZHOU Ningsheng on behalf of Mr. XU Dianli, General Secretary of ACRI; "China and North Asia could make a presentation on 'Robotics and automation trends in steel continuous casting' " by Mr. R Joe Yi, Marketing and Technology Director, Vesuvius; "Development and application of high purity mirco-crystal periclase in Tibet, China" by Mr. LIU Baikuan, President of Puyang Refractories Group Co., Ltd.; "Development and application of new chrome - free magnesium spinel refractory for RH refining furnace" by Mr. ZHAO Jizeng, President of Beijing LIRR High-Temperature Materials Co., Ltd.; "New progress in research and development of refractories in China" by Prof. HUANG Ao from Wuhan University of Science and Technology. These reports expounded and analyzed the current status of refractories industry from different perspectives, and provided new ideas and methods for the future development of the industry. At 2:00pm on Nov. 16, Refwin made an exclusive interview with Mr Stefan Borgas, President of WRA and CEO of RHI Magnesita, on WRA's mission and future development plan, the meaning to hold WRA conference in China, and future trend of global refractories industry and problems should be solved by WRA (Pls keep tuned for further detailed report from Refwin). On Nov. 17, some WRA meetings participants paid two plants visit to Zhengzhou Annec Industry Co., Ltd. and Zhengzhou Ruitai Refractory Technology Co., Ltd. in Henan province.